For as long as I can remember, there has been a lack of representation for women in technology, especially in mainframes. Despite having a history that includes leaders such as Grace Hopper, women have typically been scarce. This is not an issue unique to mainframes or SHARE. 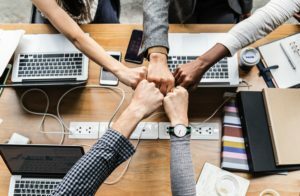 When the Open Mainframe Project first mentioned the idea of collaborating on an initiative to support Women, SHARE quickly jumped onboard and decided that it’s time we, as an association, help change the conversation. We hope the sessions offered at SHARE Phoenix will be the start of a longer-term initiative to develop a community that encourages women in the field, and becomes a place to find support, share best practices, and network with like-minded individuals. Through networking opportunities, panel discussions, and sessions presented by women in the field, we hope to create an environment of mutual support among existing members, and create opportunities that will ultimately welcome more women into SHARE. Below are a few activities you can expect to see at SHARE Phoenix, which includes kicking-off the “Women in Technology” initiative with a networking lunch sponsored by the Open Mainframe Project. For more information on SHARE Phoenix (March 10-15) and Women in IT sessions, visit the SHARE Phoenix website. SAN FRANCISCO, February 11, 2019 – The Open Mainframe Project (OMP) announced today that Zowe, an open source software framework for the mainframe that strengthens integration with modern enterprise applications, is now production ready less than six months after launching. Any enterprise or solution developer can access the Zowe 1.0 source code or convenience build and incorporate it into their products or services with the agility and scalability of a cloud platform. The Zowe framework provides interoperability and using the latest web technologies among products and solutions from multiple vendors. It helps enable developers to use the familiar, industry-standard, open source tools to access mainframe resources and services. Since launch, there has been a huge community response with more than 1,700 beta downloads, 700 +members of the project’s communication tool (220+ daily active users) and more than 50 committers. With the ever-increasing deployment of hybrid architectures, mainframes need to manage a bigger volume, variety and velocity of data and transactions. OMP is dedicated to modernizing the platform for mission critical apps and blockchain – where fast data access, transactional scale, and the highest level of trust are required. The Zowe framework is part of this mission as it will enable an ecosystem of software solutions intended to provide a simple, intuitive environment for a variety of IT professionals performing administrative, development, test and operation tasks on z/OS, and help onboard the next generation of mainframe users. Additionally, Zowe earned the Core Infrastructure Initiative (CII) Best Practice Badge, which means it is following best practices and conformance in driving secure software development and governance in open source. The Core Infrastructure Initiative is a collaborative, pre-emptive program and approach for strengthening cyber security that is widely supported by industry leaders like IBM, AWS, Google, VMWare and Cisco. The CII Best Practices Badge is a rigorous assessment of an open source project’s processes and infrastructure; other open source projects that has achieved the badge include Linux, Kubernetes and Node to name a few. The Open Mainframe Project will be on-site next week at THINK 2019 with several speaking sessions about Zowe and a happy hour. Visit the OMP website to learn more. The Open Mainframe Project is intended to serve as a focal point for deployment and use of Linux and Open Source in a mainframe computing environment. With a vision of Open Source on the Mainframe as the standard for enterprise class systems and applications, the project’s mission is to Build community and adoption of Open Source on the mainframe by eliminating barriers to Open Source adoption on the mainframe, demonstrating value of the mainframe on technical and business levels, and strengthening collaboration points and resources for the community to thrive. Learn more about the project at https://www.openmainframeproject.org. The Linux Foundation has registered trademarks and uses trademarks. For a list of trademarks of The Linux Foundation, please see its trademark usage page: www.linuxfoundation.org/trademark-usage. Linux is a registered trademark of Linus Torvalds. Tim Brooks from IBM keeps us up to date on all things Zowe and offers pointers to anyone using the platform. Zowe is an open source project on z/OS and has been developing very quickly over the past ~6 months. With two week sprints and a monthly release cadence, most people don’t have the time to keep up with all the community developments and still do their day jobs. Time is always the most valuable and finite asset, so the following resource recommendations have been categorized based on the amount time and commitment you have to devote to keeping up with the Zowians. LinkedIn: Search and follow #Zowe to make sure Zowe announcements appear on your news feed. Also, feel free to connect with me – I try to post the 1-2 most important developments each week. Twitter: Search and follow #Zowe to see the most recent conversations. Also be sure to follow @OpenMFProject, the community that hosts the Zowe project. Zowe.org: This is the developer community site and there’s a lot to explore. A great place to start is the project documentation and visit the “Getting Started” section to learn about the architecture and components. If you keep reading you’ll find the archive of the release notes which describes what’s new or changed in each release. Ask for an Overview Presentation: Work with your software vendor, or reach out directly to the Zowe User email distribution list and connect with a Zowian to schedule a 1-on-1 project overview presentation. Get connected with the developers: We use a variety of tools in the open source community. The most direct and quickest way to connect is through Slack. You can’t use slack, or don’t have access? No problem reach out to the Dev User email distribution. Even if you have access to Slack, you should subscribe to this Dev User email distribution because it’s the same tool we use to schedule our meetings/scrums. 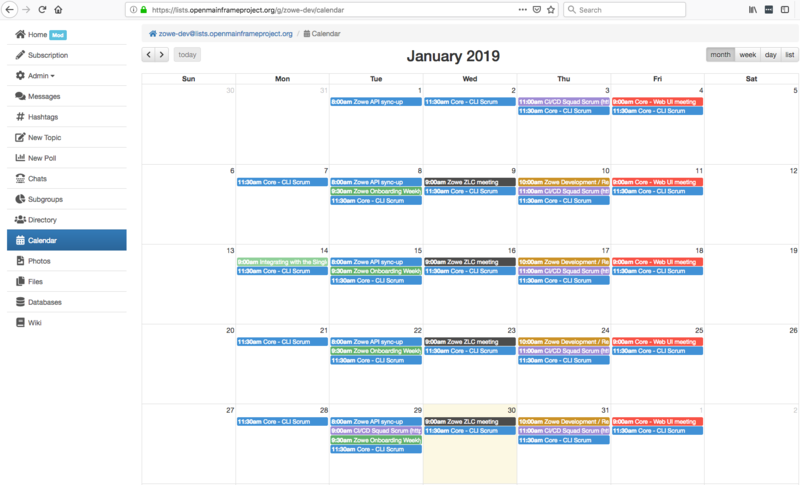 Join one of our open zoom meetings by viewing our developer calendar. We use Zoom for all our meetings, and minutes are posted here. 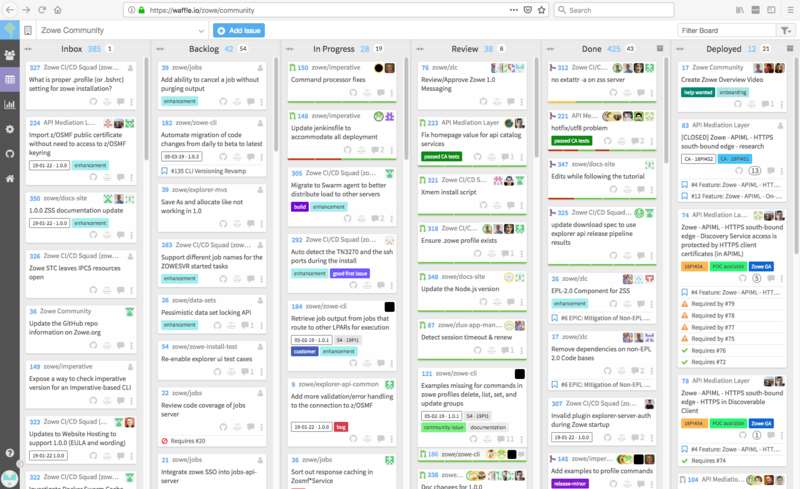 Check out what we are working on: We use Waffle, a Kanban tool that aggregates all our Git Issues. You can use Waffle filters and tags to see who is working on certain issues, when they are expected to be done and which Git repo the issue belongs to. Get your hands on the source: Visit our Github page to view the source files and please submit issues, make pull requests and ask for help. Fig 1: Zowe Community Waffle (Kanban) Board: Used to manage all Git Issues open across all Zowe Git Repos. Use the filter in the top right to filter for what you are looking for. Fig 2: Zowe Community Developer Calendar: Used to bring Zowe community members together for scrums/standups as well as cross squad playbacks. Each squad manages its own set of repos and calendar events. So there you have it. Keeping up with the Zowians is as easy as determining how involved you want to be in the project and community. If you have any problems accessing any of these resources you can always reach out to the Open Mainframe Project who manages our open source tools and services by sending them an email at omp-members+help@lists.openmainframeproject.org . In our latest episode of the “I am a Mainframer” podcast, Steven Dickens chats with Ludmila Salimena from IBM. Ludmila has been in the Mainframe industry since 2009 after entering the Master the Mainframe Competition. Ludmilla describes how she began her career in working with the mainframe, and gives advice for those looking to work with the platform. 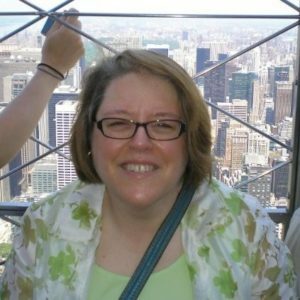 She also describes how she’s planning on helping the next generation of mainframers through internship programs and networking. Steven: Hello and welcome. My name is Steven Dickens. I’m here today on the Open Mainframe Project, I’m A Mainframer podcast. The Open Mainframe Project is a Linux Foundation collaborative project that it promotes Linux and Open-Source on the Mainframe. I’m joined today by my guest Ludmila Salmena. Hi, Ludmila. Ludmila: Hi, Steven. Thank you. Steven: Yeah. Thank you for joining us. Always good to talk to people from around the world, so maybe if you could just give us a little background on yourself, and give us a little view on your career and how you’ve been working in the mainframe ecosystem? Always good to start there and get your perspective. Ludmila: Sure. My first job position was not in the mainframe world. One day, I entered the Master the Mainframe Competition, and that was my door to the mainframe world. It was not the first time I heard about mainframes because my dad is also mainframing, so it was pretty easy. So because of him, I already knew about mainframing. I knew how powerful and important mainframes are to many companies. After I completed the Master the Mainframe Competition, I got an internship opportunity at IBM. That was back in 2009. I started as an upper salesperson but in a few months, I started to work with the compass in Brazil. 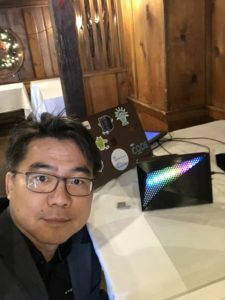 Since I was hired, I was in the academic initiative program for IBMZ, but year after year, I was incorporating other activities related to the ecosystem such as working with clients and their strategies for IBMZ, developing community outreach such as the fair, hackathons, events, meetups. It’s a very broad bunch of activities. Steven: Okay. Something interesting there that you mentioned, you mentioned your father was on the mainframe. Can you maybe just give us a little view of what he used to do on the platform? Ludmila: He is still a mainframer. Ludmila: Yes. He’s DBA DB2, and worked with ZBM since the beginning. Ludmila: As you can imagine, after many years hearing him talk on the phone and seeing him working from home with green letters, mainframe was not a mysterious thing to me. I used to go with him to the office and play with terminals. It would be great to have some cameras at that time, so that I could share some interesting memories right now. Steven: Oh, fantastic. You’ve been a mainframer since the age of six by the sound of it? Ludmila: Yeah. We can say that. Steven: Excellent. One of the other things you mentioned was your first encounter with the mainframe. Well, probably in your professional career at least was in the Master the Mainframe Contest. That’s a really interesting program and I know a lot of our listeners will maybe have heard about it, but it will be good to get your perspective of that contest and how that provided a portal into both the mainframe world and IBM. Ludmila: Yeah. The essence of the contest is showing different terms and information you needed in your mainframe job position. The focus of the contest is exactly to achieve all kinds of participants. If you have no knowledge on mainframes or any kind of enterprise level IT, this is the correct place to start. If you tell me, “Hey, I already know a little bit on mainframes.” Master the Mainframe is also a good place to keep learning. Every year, we launch a bunch of new activities. Each challenge is different, is unique. You can have experience from JCL, COBOL. There are also many coding challenges that you can learn about it. Steven: Okay. It sounds like a broad range of activities. From your experience, what have you liked most as you’ve gone onto the mainframe platform? Either in the Master the Mainframe contest or since you’ve joined IBM, what’s been your passion? Ludmila: I think there are many strengths related to mainframe that I like. I think the one that I like most is the compatibility because it’s very interesting that you’d be able to upgrade your hardware and know that all programs will continue working without code changing is amazing. I am a little bit far from the technical side now for a few years, but those kind of strengths are very interesting on the platform. Steven: Okay. Now, you’re working within IBM, and with schools and universities. You’re working in an academic program to try and pull those institutions through onto the platform. What’s the feedback you’re getting from those academic institutions as you try and position the mainframe technology? Ludmila: In Brazil, there are many rules guiding the university’s curriculum. When I speak with these schools and universities, usually I tell them to incorporate the mainframe content in their curriculums, but they complain that they are not seeing job opportunities for their students. Therefore, I have been working with the IBMZ community to pair them closely with those universities. So faculty can see there is opportunity in this place and the companies can share appropriately this information with the academia in general. Steven: Okay. You see the biggest challenge moving forward is that joining of the academic institutions with the people who would actually have those job roles, i.e. the end clients. Is that where you see the biggest challenge moving forward? Ludmila: Yes. The communication between mainframe employers and academia must exist and needed to be proven. Unfortunately, this is not happening as much as I’d like to. The academia is preparing the professionals of the future and today, you can work with high school students coming into colleges, universities, etc. The students today don’t know of the kind of job possibilities they can look for. The companies today, they are (the ones) who are implementing and being a part of the technology transformation and they needed to visit schools and show to faculty and students the possibilities of technology because it’s huge. I am here happy to work with employers to introduce them to academia community to make this happen. Steven: So I think if I was to give you a title, it would be a mainframe matchmaker. You’re making that match between the academic institutions and the students and the employers, the end users of the mainframe, and really trying to join those two communities together and get them to work with each other. Would that be a fair summary? Steven: That’s your new title, Ludmilla, mainframe matchmaker. Ludmila: Yes. I’m going to add this. Ludmila: There are many possibilities. As a student, you can get involved with Master the Mainframe, you can explore and use the Linux cloud as you already mentioned, you can go to internship programs on Open Mainframe Project and also explore some identical patterns related to mainframe. 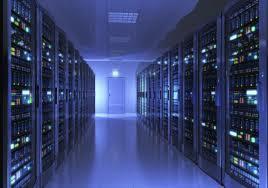 All of them give you the experience in all levels to get into the mainframe industry. Steven: Okay. That’s obviously people looking to get into the mainframe space, students. Obviously, a lot of our listenership here is already in the mainframe space. What would be those best practices or tips for those people already in the mainframe industry maybe looking to our different skills, maybe looking to move jobs? What type of advice, hints and tips would you give to people already in the mainframe space? Ludmila: The same channels that the students can use of course, and each one is going to take advantage in his or her way. But I think staying up to date in all modern capabilities and tools on mainframe can provide you a long future, a brighter future. We have to update ourselves. Steven: Okay, excellent. Speaking from the Open Mainframe community side, what would you like to see from us? How would you like to see the community evolve over time specifically in the skill space? Ludmila: The Open Mainframe Project has a unique ability to access a broader open-source community. I’d say I would love to see them share the value of this platform with the community that can help get the word out there. Steven: So it’s getting the word out and try and use the community that we’re building within the Open Mainframe Project to amplify the message and reach new audiences? Ludmila: Yes, because we have many developers that work today, and they just don’t know the possibilities using mainframe and open-source. So this project is amazing to give opportunities to developers. They’re already creating amazing products. Steven: Fantastic. One of the things that’s been big and hot in our community over the last few months since the summer has been this Zowe Project. This is bringing open-source and crowdsourcing development to the once closed world of ZED OS, which for me is just really fundamental and transformational about the way that open-source as a movement is interacting with probably the last bastion of closed source code, ZED OS. So for me, it’s been a really transformational time. Question for me, how does open-source help with the challenges of universal mainframe development and particularity through a Zowe lens? Ludmila: Open-source allows today’s developers to use the tools they are comfortable using. They can leverage the power of the platform with those specific skills. Steven: You think it’s going to break down those sort of skills barriers and those barriers to entry to the platform. Is that where you think Zowe is going to be most powerful? Ludmila: Yes, because you don’t need specific skills, and open-source connects everybody today and this project is amazing and it’s very recent and I’m looking forward to working closely with students. Especially in Brazil next year. Steven: A couple of questions I ask everybody in this type of forum. First off, if you had a crystal ball, and you could look three to five years into the future, would you be able to give us your view of the mainframe three to five years from now? How do you think it’s going to be impacting the industry? Ludmila: Wow. That’s a tough question. Steven: It catches everybody out. So it’s a good one to make you think. Ludmila: Yeah. In my point of view, I expect that the developer community & the students can see the modern mainframe the way we both know. I see that in three years, considering all situations we are facing in many countries, this can position us in a very important platform to many industries such as education and banking, since we already have already a long history with them. Steven: Okay. The second question that I always ask is if you could speak to the Ludmila that was at college, and go back in your own life, what would you say to the young 20-year-old Ludmilla about how to build a career on this platform? What advice would you give to a younger version of yourself? Steven: As a father to a 15-year-old daughter, your advice is listen to your father. Ludmila: Yes. I won’t show this podcast to him. Steven: I’m going to play it to my daughter so that she listens to it somehow. This is fantastic. Just as we look to wrap up, Ludmila, just a sort of final couple of questions if you’ll permit me. Are there any specific requests or interests you have within the Open Mainframe Project as you look ahead for this next 12 months? Ludmila: I am very excited about Zowe and the new ways students will be able to interact with the platform. I wanted to be able to share it with them, and provide them the opportunities to participate in the open-source community, so that they can build their skills. Steven: Okay. You see internships and Zowe as the things that are of most interest to you over the next 12 months? Ludmila: Yes. The real life experience is something that helps you create your path with your career. It’s a very good opportunity. Steven: My final question, what advice do you have for the mainframers working in the IT industry? Ludmila: For this one, we would have to record a new podcast to just talk about it. Steven: If I can keep you brief Ludmila, what would be your maybe top two or three pieces of advice? Ludmila: First of all, I think the most important is to shift perception, because we need to promote our strengths, our value impact, and the opportunities in mainframe. Mainframe is such a modern technology with so many possibilities, that we all should be talking about this all day. If I can say, please remove the acronyms. Remove the jargo. Remove all these letters from the job descriptions because it’s not helping to attract the new professionals. The new generations don’t know those names. They don’t know what JCL is but, they are amazing programmers. They can learn about COBOL. They can pursue any mainframe job position. But sometimes, they are afraid of the acronyms. Once again, be close to school, your faculty and students, because you can be a guest speaker to a mainframe class. You can be a mentor. There are so many possibilities, but we need to put everybody together and connect all mainframers. Steven: Ludmila, that’s been fantastic. It’s been a real pleasure to talk to you over the last few minutes. Any parting comments? Any final things before we wrap up? Ludmila: I think the last thing that I would add here, it’s important to us to go to the community where we can find the mainframers. We don’t have to expect them to come to ours. That’s the reason why I am parting up meetups, conferences, communication channels. I’m organizing a series of meetups in Brazil, and I think everybody should be creating and promoting this knowledge and experience to the students and future mainframers. Steven: I couldn’t agree more, Ludmila. I think getting involved in the community and building the platform and breaking down some of those barriers is certainly why I see myself as a mainframer. From our conversation today, it sounds like that’s where you see yourself as a proud mainframer. Thank you very much for your time today, Ludmila. It’s been fantastic to talk to you. Ludmila: Thank you, Steven. It was great. Steven: You’ve joined me, Steven Dickens on the Open Mainframe Project, I’m a Mainframer podcast. Please look for us on iTunes and other platforms and click the subscribe button. We’re going to be here talking to you on a regular basis around what it means to be a mainframer going forward on this platform. Thanks so much for your time today. 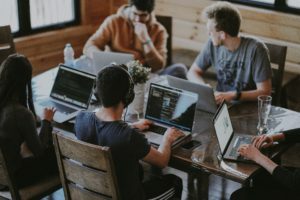 Finding a job in 2019 can be a very difficult task for students looking to establish themselves in their desired careers, especially for those looking to work in tech. However, students can land their dream job by participating in a valuable internship program. Internships can help students begin their careers by allowing them to gain valuable working experience and acquire the skills that employers look for in job candidates. Internships also allow students to build their professional network by networking and collaborating with other professionals. By working as an intern, recent or soon to be graduates will have a better chance at landing their dream job. 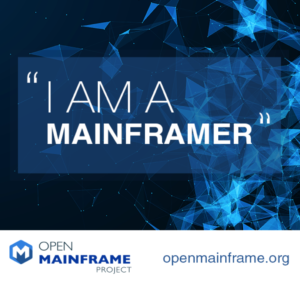 The Open Mainframe Project is committed to training the next generation of mainframers and is proud to do this through its internship program. Now in its fourth year, the OMP internship program offers an opportunity for eight students to select a development project – presented by member companies – that’s based on Linux and open source software. Interns will work remotely with a mentor for the duration of the internship and learn more about all things open source and mainframes. Due to the mentorship and real-world experience given to interns, the OMP program has seen a 100% increase in applicants each year. At the end of the program, interns will have the chance to present their project at an upcoming industry conference. OMP will provide a stipend for travel for each student, and will provide professional resources and training to help build their professional skills. Students interested in participating in the internship program are encouraged to submit their applications by the February 16th deadline. For a list of suggested intern development projects, please see our Project Ideas Page. To learn more about the program, or to submit your application for program, please click here. Stay tuned here for more details about the internship program by former interns themselves! They’ll share their experience, key learnings and what to expect as an intern. 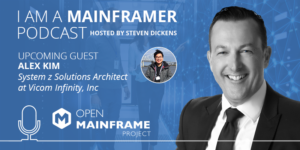 Steven Dickens, host of the “I am A Mainframer” Podcast & Open Mainframe Project Marketing Chair, recently penned a blog for Mainframe Debate. Steven takes an in-depth look into the role that mainframe technology played in 2018, including the release of OMP’s Zowe project. As 2019 kicks off its still (just about) time to review 2018 in the world of the mainframe. This technology platform despite its advancing years is still evolving and re-defining itself and continuing to stay at the forefront of enterprise computing. In this blog, we will look back on what this writer thinks are the seminal moments in the mainframe world in 2018. I had the pleasure to be ‘in the room where it happened’, if you will excuse the Hamilton play reference, when Zowe launched at SHARE in St Louis this summer. 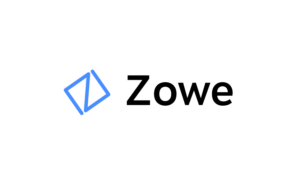 Zowe is an open source project hosted by the Open Mainframe Project which is a collaborative project under the Linux Foundation structure. Zowe offers modern interfaces to interact with z/OS and allows you to work with z/OS in a way that is similar to what you experience on cloud platforms today. You can use these interfaces as delivered or through plug-ins and extensions that are created by clients or third-party vendors. Zowe consists of the following main components. While the tech is cool and you should look to get involved in how this code base develops, for me the more interesting thing is the Open Source, crowd sourced nature of the project. z/OS has long been the poster child for a closed. proprietary, single company developed OS. This changed with the launch of Zowe. IBM opening up the core of z/OS to the wider community and letting everyone have access via GitHub and just get stuck in is huge, and for me at least is the arbiter for things to come for the platform as a whole. IBM’s Cloud Platform or ICP is the future of software for how IBM envisages multi and hybrid cloud management. We see clients deploying private, public and hybrid clouds in increasing complexity. The whole cloud space is maturing with clients, quite rightly, seeing the various pros and cons of various on and off premises models as well as looking for sourcing variety in their public cloud deployments. 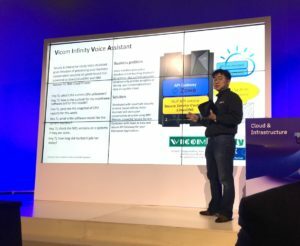 IBM is as far as I can tell the only vendor that sees this multi, hybrid model as the future for clients and is building solutions for this reality, while others look to drive vendor lock-in. The mainframe is a large part of a client’s IT estate and rightly has a strategic role to play in how this private cloud platform interacts with other on-premises and public cloud instances. ICP will manage this cloud orchestration and provisioning layer in a multi-platform way. Further with the announcement of ICP manage from, clients can now look to deploy the management nodes directly on their mainframe or LinuxONE platform. This is huge for clients who want to deploy the mainframe as a cloud manager and not have to rely on commodity x86. 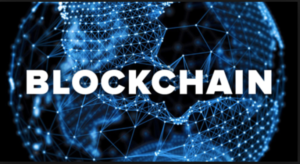 2018 was the year where Blockchain spilt over into the public consciousness, mainly as the underlying platform for Bitcoin, but for the business community not having an active Blockchain project probably meant you weren’t ‘cool’. IBM has long offered enterprise Blockchain based on LinuxONE technology on the IBM Cloud. This enabled clients to take advantage of both the resilience and security of LinuxONE as they looked to deploy their Blockchain projects. However the public cloud was the only IBM supported deployment option. Not now. IBM Blockchain Platform now enables clients to deploy a supported hyperledger fabric and all of the required management tooling behind their firewall and on-premises. This enables clients to take greater control of their infrastructure, rest easier about data residency and also explore models where their Blockchain deployment can sit on the same infrastructure as their ‘system of record’. This choice to be able to deploy on LinuxONE in your own datacenter, will, in my opinion, drive new innovative uses cases and widen the deployment of Blockchain as a technology. IBM late in 2018 signed a multi-year strategic relationship with Samsung Electronics where the latter will fabricate the IBM designed next generation of 7nm based Z and LinuxONE chips. This long-term strategic partnership cements the future of the platform and reconfirms the long-term commitment by IBM to the mainframe and LinuxONE platforms for many years to come… This is definitely an announcement you will want to read more on, so check out the IBM press release here. Finally, no mainframe review of 2018 could go to press without referring to the ZR1 and Rockhopper II launch mid-year. Having the mainframe ship in an industry standard form factor is significant in so many ways for the platform. A few years back I met with the head of datacenter design for a co-location datacenter where hyperscale cloud providers hosted their infrastructure. This person was new to the mainframe, and after listening to my pitch they were impressed with what the box had to offer. However, the physical dimensions of the box were an issue. When I dug deeper the client responded: “well apart from being too deep, too wide, too tall, the heat flow being back to front and the cables coming out of the wrong place, the box is a great fit for our environment.” All of this changed with the ZR1 and Rockhopper II. Read more at Mainframe Debate. Join Open Mainframe Project at Open Fintech Forum on Oct 10-11! The Open Mainframe Project will be at The Linux Foundation’s first-ever Open FinTech Forum on October 10-11 in New York to shed light on the modern mainframe. The modern mainframe is touted as the core of trusted digital experiences and operates in some of the largest and most demanding computing environments in the world. From the days of the System/360 in the mid 1960’s through to the modern mainframe of the z14 the systems have been designed along four guiding principles of security, availability, performance and scalability. On October 11 at 11:30 am, John Mertic, Director of ODPi, and Goran Begic, Sr. Director of Product Management at CA Technologies, will present a session titled, “Connecting Modern Application Developments to the Mainframe with Zowe.” Attendees will learn about Open Mainframe Project, details about the newly launched Zowe and showcase how attendees can get involved in this new open source project based on z/OS. In this panel session, you’ll hear perspectives of key executives in the mainframe space on the current and future of the mainframe, as well as how open source technology is driving growth and cementing mainframe as a sustainable infrastructure choice for decades to come. I will be moderating the panel and Alan Clark from SUSE, Steve Conger from ADP, Calista Redmond from IBM and Andy Youniss from Rocket Software will join me. Here’s a little preview of what to expect from the panel.